Tonight, at exactly 8:30 pm Manila time, I will be turning off the lights for an hour. I did the same thing last year. I will do the same thing this year, tonight, at exactly 8:30 pm. I will be joining all the others in making a stand against climate change. 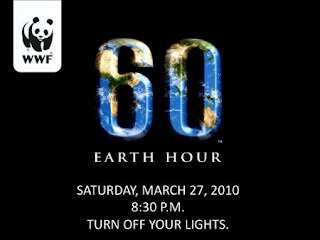 Let's be part of the Earth Hour! Let's help raise awareness of climate change issues. This is for a low-carbon future. Let's help save our Mother Earth! Let me first tell you some recent highlights in my life. Well, just about my most recent homecoming in GenSan. I was able to spend time with Lainy. Had quite a few chats with her since she was very busy at work but still was able to spend time with me. and played badminton with friends. I also was able to visit my Alma Mater - Notre Dame of Marbel University with my good friend Denden. And jammed with the Kuerdas Band on their gigs. I really had fun! Although me and my Mom still don't get along that well, I was glad I was able to spend time with her. There's indeed no place like home sweet home. I think about that too! And I have a good news for everyone! This blog is REALLY BACK! A lot has happened. I had problems with my internet installation which obviously got resolved already. I was on vacation for 10 days and most part, I just got really lazy to update this blog. But now, I have already decided to go back and update this blog. You will be able to read some more of my kinda rubbish yet entertaining posts. I'll do my best to make entertaining articles for you guys!